Education Doctor of Physical Therapy in 2007, Sacred Heart University Bachelor of Science in Athletic Training in 1997, Southern Connecticut State University Certifications Certified Myofascial Tigger Point Therapist Graston Technique® Clinical Specialties Musculoskeletal disorders, sports-related injuries, myofascial release therapy and biomechanical foot assessment. Organization Memberships American Physical Therapy Association American Physical Therapy Association, Sports Section American Academy of Orthopedic Manual Physical Therapists (AAOMPT) Outside of the clinic… Anthony loves spending time with his wife and two children. He’s dedicated to staying healthy and fit, and loves to participate in the Cinco K de Mayo in Orange every year as an event sponsor and runner! Education Doctor of Physical Therapy, Boston University Bachelor of Science in Physical Therapy, Penn State University Certifications Board Certified Orthopaedic Specialist Graston Technique® Manual Therapy Certification, Evidence in Motion Clinical Specialties Evidence-based manual therapy, orthopedics, sports-related injuries, and balance disorders. Juliann also serves as Center Coordinator for Clinical Education at PTSMC. Awards & Honors 2017 PTSMC Leadership and Management Development Program Organization Memberships American Physical Therapy Association American Physical Therapy Association, Orthopedic Section Connecticut Physical Therapy Association, Manual Therapy & Orthopedic Special Interest Groups Greater Milford BNI Outside of the clinic… Juliann enjoys exercising, arts and crafts, and traveling with her husband. She is an avid sports fan! She cheers for the New York Giants, Penn State, and the Pittsburgh Penguins. She additionally loves going on hikes with her dog! Education Physical Therapy Orthopaedic Residency Program in 2017, Sacred Heart University Doctor of Physical Therapy in 2016, Sacred Heart University Bachelor of Science in Physical Therapy in Exercise Science in 2013, Sacred Heart University Certifications Board Certified Orthopaedic Specialist Levels I and II IAMPT Trigger Point Dry Needling Levels I Fibro blaster instrument assisted soft tissue mobilization Clinical Specialties Movement & System Impairment and Syndromes of the Lumbar Spine and Hip, geriatric health and wellness, and neuromuscular impairments. 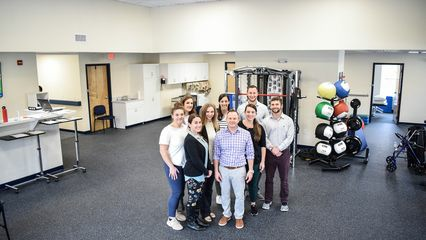 Nick also teaches for Sacred Heart University’s DPT program and is a faculty member of PTSMC’s Orthopedic Residency Program. Organization Memberships American Physical Therapy Association Outside of the clinic… Nick brews beer and his collection of beer bottles has grown to over 300 from all over the world. He also enjoys running, fishing, hiking, and my second love in life is the New England Patriots. Education Doctor of Physical Therapy in 2013 , Quinnipiac University Bachelor of Science in Health Sciences in 2016, Quinnipiac University Certifications Graston Technique® Level I Clinical Interests Sports-related injuries and geriatrics. Organization Memberships American Physical Therapy Association Outside of the clinic… Katy likes to go on walks with her dogs and plays in a bowling league (for fun – not skill), and loves to check out local breweries and wineries with friends and family. Education Bachelor’s of Science in Biology in 2011, University of Mary Doctorate in Physical Therapy in 2015, Washington University in St. Louis Master of Science in Clinical Investigation in 2015, Washington University in St. Louis Certifications Movement System Impairment Syndromes and Diagnosis Currently completing certification in Mechanical Diagnosis and Treatment Clinical Interests Stephanie’s clinical interests include chronic pain, the spine (including neck and low back pain), movement and biomechanic training, shoulder pain, and prevention of pain problems. Outside of the clinic… An active member of the national physical therapy community, Stephanie has served on multiple national task forces for the American Physical Therapy Association (APTA) and actively lobbies for healthcare policy issues at the local, state, and national levels of government. Stephanie is a nationally sought after speaker and consultant for topics on social media use, generational issues, and organizational membership and currently manages the social media accounts for the APTA Academy for Physical Therapy Education and PT Day of Service. She is also the co-host for The Healthcare Education Transformation Podcast, which focuses on innovations in healthcare education and delivery. Stephanie is a Passionate Chicago Cubs fan who enjoys playing the saxophone, writing and weightlifting in her spare time. During business and leisure travels, she is always up for exploring local foodie and coffee destinations.